These Valentines Day Projects for Preschoolers and Toddlers were hand-picked for even the smallest of hands to participate in. Easy-to-do project that even the youngest child can make look really good! Paint stripes of red, pink and purple to cover the entire piece of watercolor paper. Cut different sized hearts out of the painted paper. 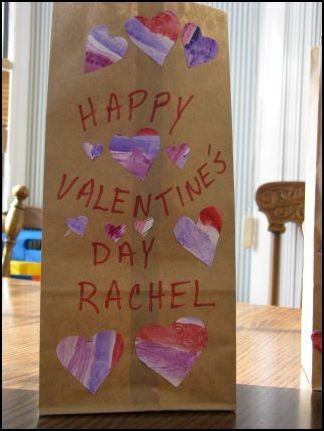 Write the child's name on the brown paper lunch bag and then have the child glue hearts on all sides of the bag. I always have the children in my daycare bring Valentines for all their friends. We make a card holder a couple of days ahead of time so we're ready to go on the big party day! Cut a Chinet plate exactly in half. Paint the top surface of one plate and the bottom surface of a half plate red. Punch holes at 1" increments at the bottom half of the big plate and on the half plate. Line up the holes and thread the ribbon through to hold them together. Decorate the plate with jewels, stickers and decorations, using hot glue when necessary. Attach a ribbon to the top for hanging. Kids who are experienced with cutting can cut out their own hearts for this project. The younger kids can enjoy gluing on the hearts that were cut out for them. 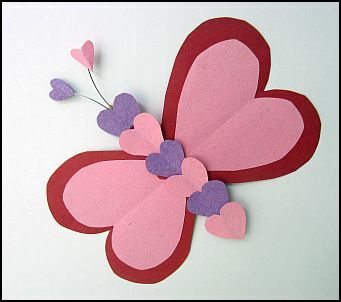 For each Love Bug, cut two 4-1/4" squares of red construction paper and two 3-1/4" squares of pink paper. Print out the Love Bug stencil onto card stock paper and cut out the shapes. Fold the two squares of red paper in half, place the 4" stencil with the dotted line along the folded edge of the paper. Draw the shape onto the construction paper. Let the children cut along the line to make a heart. Follow the same instructions with the pink paper, cutting a 3-1/4" square and using the 3" stencil. Using the glue stick, glue the 3" heart onto the 4" heart. Glue the points of the hearts together to form the wings. Using the tacky glue, place a dab of glue onto the popsicle stick and place the wings in the appropriate position. Let dry. Cut a 1-1/2" x 4-1/2" strip of both pink and purple construction paper. Fold in half lengthwise. Using the 1" stencil, place the dotted line of the stencil along the folded edge of the paper. Draw four hearts for the child to cut out. (Note: These smaller hearts are harder to cut and may have to be done by an adult.) Keep three of each color. Cut the fourth heart of ech color down to about half the size to make antennae. Make the antennae by placing a dab of tacky glue on the back of the two small hearts. Cut a 1-1/2" piece of wire and place in the glue. Let dry. Once dry, use tacky glue to attach attennae to the top of the popsicle stick. Let dry. Cover the popsicle with a thin layer of tacky glue. Alternate colors of the 1" hearts to cover the stick. Let dry. I debated making this project for the kids because it didn't seem like they would be able to contribute much. I decided to let them try and they pleasantly surprised me. Even a 2 year old did a good job cutting out the hands and writing the letters! 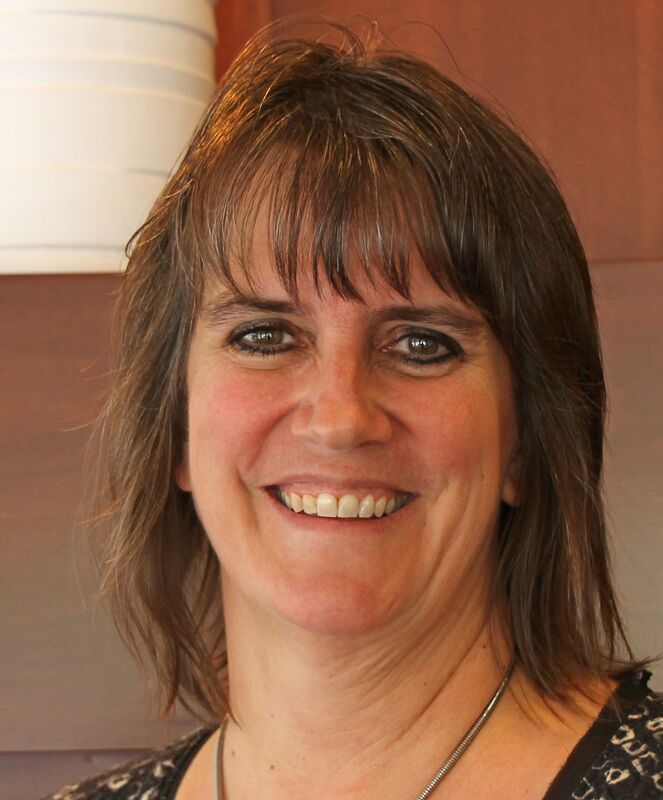 Trace two copies of a child's hand onto the red construction paper. You'll want to use the same hand because you want them to match once the card is made. Have the child cut the hands out. Write "I Love You" with black sharpie on the front hand. Write "This Much" on the folded paper strip. You can put them in an envelope to present to the parents. 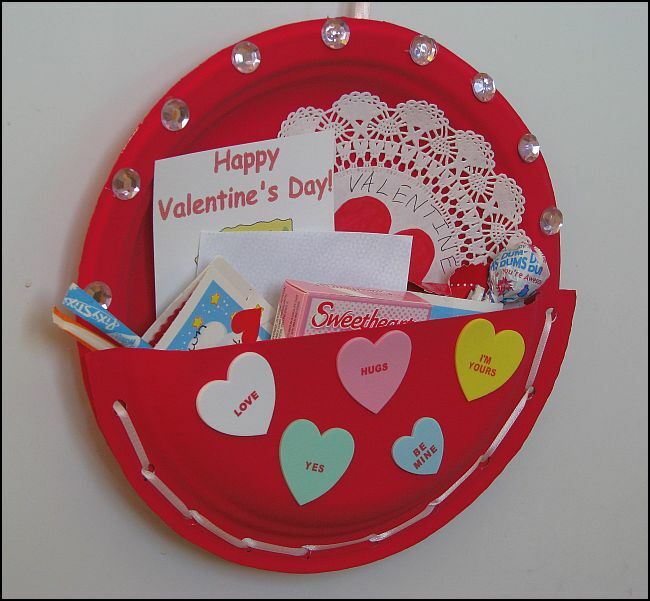 Some painting and some gluing is all it takes to make this cute Valentine project. Spray the puzzle pieces with the red spray paint. Let the kids paint the tongue depressors white. Let dry. Using the hot glue gun, glue the tongue depressors to the popsicle sticks to form the base. Use about six puzzle pieces and arrange them to form a heart in the middle of the base. Leave the top tongue depressor and the bottom depressor clear to print the words. 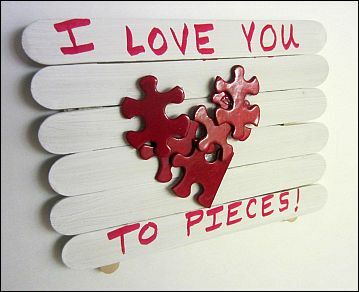 Use a Sharpie to write "I Love You to Pieces" on your sign. Attach strip magnets, yarn or ribbon to hang the project. 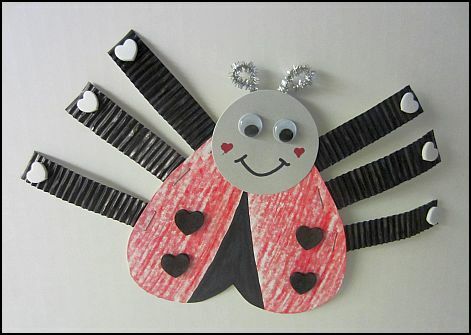 I made these with the kids one Valentine's Day because I had a little girl in my care that was just crazy for lady bugs. They turned out really cute! Print the Love Bug Stencil out on the gray cardstock paper. Cut out the pieces. Color the heart-shaped body with red crayon. Use the wiggle eyes and Sharpies to make the face. Cut two inch pieces of silver pipe cleaners and bend to make feelers. Glue on to the back of the head piece. Glue the head onto the body piece. Let dry. Cut 3" x 1/2" pieces of corrugated paper to make the legs. Staple the legs onto the body section. All of our craft foam hearts were white, so we colored four of them with black Sharpie. Glue the heart-shaped foam pieces onto the body and legs.